Thank you all so much for your contributions over the last year. I’ve learnt a ton of new stuff, made a load of new friends and generally enjoyed being involved with this blog and this community. I hope you found it useful too. All the best for the holidays and see you back here in due course. (80%) Office 2007 will continue to flounder, MS will not accept the fluent interface is a factor in disappointing uptake. (60%) Other mainstream PC makers will follow Dell and start to supply pcs with Linux installed – probably Ubuntu. And a couple of comments what I’m up to in 2008. I’ll be cutting back on Excel and VBA development work (80% ;-)). My focus for 2008 will be almost exclusively xlls and C/C++ (70% ;-) (I said this last year too)). I have some big non computing projects on which I am really looking forward to (90%). I still have loads of content for the blog, and I’ll start releasing the source for some of the VBA tools I have developed over the last few years. Some of these were initially destined to be commercial products, but I have had a change of plan. I expect to drop back to 2 or 3 posts a week (70%). What are you upto next year? And what do you think of my predictions? Big year 2007, lots of important stuff happened. EVO – the wow starts now! except it seems to have been the owww starts now. Vista was released to much fanfare just too late for Christmas. It got a mixed reception, including plenty of moans about poor device support and intrusive ‘security’ features. The main issue keeping people away seems to be a lack of compelling features to justify the move. With the carrot approach failing MS could have invoked the stick by end of lining XP on time, but they wisely extended the lifetime. SP1 is due soon, although how well it will address these concerns remains to be seen. Office 2007 was also released to the same mixed reception. Lack of compelling features and concerns about the incompatible interface have slowed adoption. SP1 was released earlier than expected, but has so far failed to allay peoples performance concerns in Excel. Excel 2007 actually has some pretty attractive features but for most they seem outweighed by the negatives of the ribbon – which penalises users in direct proportion to their experience with previous versions. A new version of the Excel SDK was also released (the first update since Excel 97) which allows access to many of the new features of Excel 2007, and shows continued support for C/C++ add-ins for Excel. Sharepoint 2007 seems to have been well received, indeed most chatter on the server elements of Office 2007 seems to have been positive. The E part of EVO, Exchange I know nothing about so couldn’t comment. 2007 saw a lot of file format noise as MS tried to get OOXML ratified as a standard. Expect this to drown out a lot of more interesting content when it comes back up in February. With the Dutch government (and others) beginning to insist on open standards based software its clear to see there is a lot at stake here. Visual Studio 2008 sneaked out early, and includes VSTO in the box – this is a major improvement from 2005. Both from a technical POV (VSTO2008 is actually deployable) and a packaging POV. Having it as a core part of VS will surely help uptake, and maybe breathe new life into the ‘Smart client’ idea which seems to have gone quiet recently. Also of note is a renewed interest in C++ with MFC for Vista and improved standards compliance. The MacBU released Office 2008 for Macs, with its new ‘lack of VBA’ feature, its not expected to sparkle in the uptake stakes. 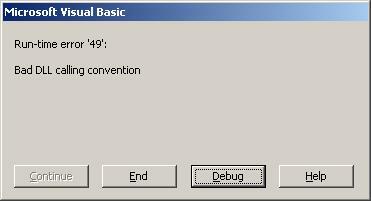 Although concerns of the implications for VBA in Windows seems to have been overstated. OpenOffice.org stepped up their VBA support and a fair amount of VBA runs fine in 2.3 or better. At this stage it is probably a bit early to suggest your VBA assets may be safer under OOo, but its a trend that may be worth watching. In the spreadsheet quality world the SOX influence seems to have calmed, whether that means everyone is in compliance or they gave up trying will probably become apparent in due course. Mac OS X seemed to get a more positive response than Vista, but it could be argued that Apple has a larger more vocal fanboi contingent. Macs also experienced a few significant malware attacks, perhaps demonstrating that their market share has improved so much even the bad guys are taking note. A major 2007 development was the availability of PCs with Linux pre-installed from big name vendors (Dell). And the massive success of the Asus Eee with its custom Linux install. You get a decent OS, full OpenOffice, Firefox, and Thunderbird (and a ton of other stuff) and a subnotebook to run it all on for 200 quid. To put that in perspective its less than the retail cost of the non basic version of Vista, or the non basic version of Office, for a fully featured PC. The march to the web continued with Google docs, Office Live, and a load of others. Someone somewhere must need all this collaboration stuff, but its not anyone I know in the spreadsheet development world. VMWare made a big market impact at IPO, bringing virtual machine technology to the attention of a whole bunch of new people. Its hard to compete with free though which is how much Virtual PC 2007 from Microsoft costs. The Nintendo Wii (in stock for 2 hours recently at a local shop) has proven a hit even though its graphics are considered less than leading edge. Apple iPods got an update and the iPhone demonstrated the differences in the US v UK mobile phone markets. There was plenty of hot air in the Web apps world in 2007 with strong signs of a full on Web 2.0 bubble. What have I missed that you think was important? 2008 predictions coming up soon. Today is black eye Friday in Cumbria. Its the day most folks break up for Christmas, go straight to the pub, get hammered and kick off. In other parts of the country they call it bleak Friday. I think it might be one of the busiest days of the year for emergency services. Has it got a different name by you? Office SP1 is not being added to Automatic Update yet. MS are giving orgs chance to test it and manage the deployment. Good, that makes sense. They have made a ‘update blocker’ available that companies can install to prevent the automatic update getting triggered. This seems a bit backwards to me. Shouldn’t the update mechanism just be more managable? The latest version of Office for Macs RTMd (last week actually). Did anyone else not really notice? Anyway it seem like the p0rn crowd have finally caught up and the junk is increasing in both quantity and obscenity. ‘Only’ 80% spam is way better than some folks, who are reporting 95% junk. I guess the sos stats are going to deteriorate as a new audience of spammers had discovered us. Is there a simple way to (mass) disable commenting on posts over a certain age in WordPress? Just posted a brief note about the feedback from the conf here. Basically it was very good. I had an elaborate plan (plan might be too strong a word) to set up a little wireless network and a simple page or 2 people could browse to and submit to a server running on my laptop. And then I was going to leave a couple of laptops around for people to use to submit. Maybe next year. I had assumed that wireless internet access would be exorbitant at the hotel, and was not disappointed – I can’t remember the pounds cost, just the ‘what a rip off’ response. Anyone ever got that in a pure VBA system? I’ve seen it when using dlls and trying to pass byRef when the dll wants it byVal. (well in fact in most of the cases mentioned here). But I don’t recall seeing it in a pure VBA project that isn’t using dlls (or non standard references). I always worry though, that something deep inside may be going horribly wrong quietly. I couldn’t get the code to break on the problem line, it just seemed to get upset returning from a function call. I very rarely have problems with VBA, but there are one or two projects I look after that throw freaky errors quite regularly. How about you?